With much patience comes great things. Initially I asked Dan if he wanted to play, and he agreed to play. Then the only problem that we faced was finding a time when our schedules lined up! I missed him before he left to IPL5, so I knew there would be a good amount of time until we actually got to play my 1000th win. I finally caught Dan on Saturday night via Twitter and he said we should play Sunday morning. I got on Sunday morning, Dan threw me an invite, and things got real. We didn’t boot up Ventrilo or Skype, I just tuned into his stream and listened to him chat about the game. The start of the game was super stressful for me. I got matched up in a mirror match with Ezreal, and to see all these Gold and Diamond players in the loading screen told me that the enemy bot lane was going to have some talent as well. Now the only thing setting the two Ezreals apart is our supports. I got Taric, who has some moderate burst and decent sustain, vs Zyra, who has ridiculous range, amazing snares, and insane burst damage. Luckily, we’re not playing in the League of Legends right now, we’re playing in the League of Cleavers. This means that the League is no longer ruled by the best players, but rather this patch you win if you have the most Black Cleavers on your team. I tried to get ahead in CS because I knew that Zyra would help Ezreal win any trade or encounter that we had. I got ahead by 20 CS, then 30, then 40, just kept widening the gap. When Dan ganked bot I went down, and I thought Ezreal finished me off. However, it was actually Zyra’s plants that picked up the kill. I managed to get a double kill on Ezreal and Nocturne, which put me in a good spot in bot lane. I felt bad for top because it got ignored until the enemy Jax was so big that we were all afraid of him. Well, everyone but Dan. This Jax showed up to a team fight mid with finished Trinity Force and Guardian Angel, ready to fight. He was ahead of everyone in the game in CS as he had been crushing our Xin in top lane. Karthus tried to keep up with me in deaths, but I just had him beat. 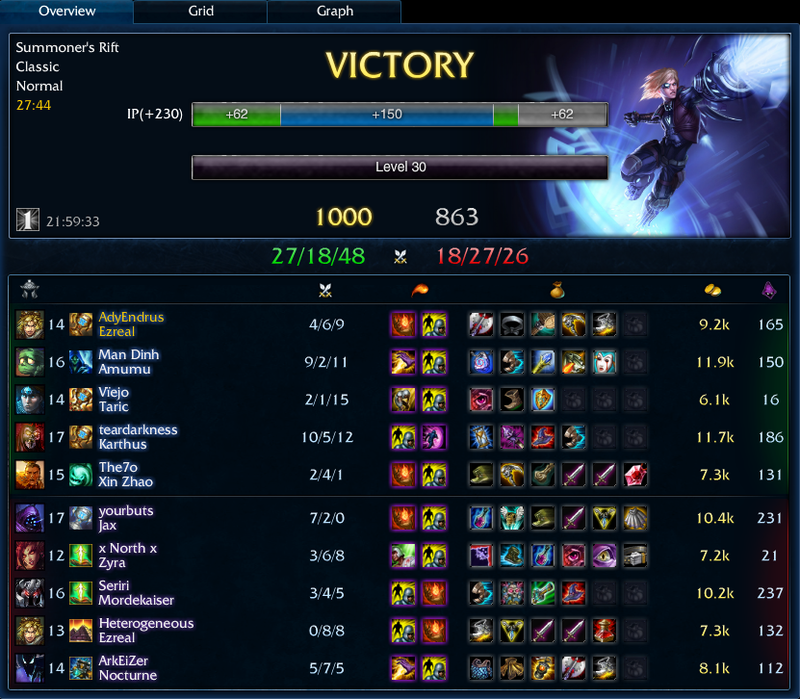 Luckily, I wasn’t the worst Ezreal in the game, which is good enough for me! Thanks for the 1000th Normal win, Dan! Not bad throwing in a triple and a quadra kill. Keep being the man in the jungle! as Lawrence responded I'm dazzled that someone able to get paid $7656 in a few weeks on the internet .